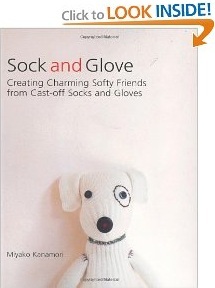 This book presents 16 charming soft projects that are quick to make and certain to amuse and delight. Full of individuality and mischief, these stuffed creations are all pieced together from ordinary socks, gloves, and mittens. Step-by-step illustrations and instructions make it easy to craft and dress a whole menagerie, including monkeys, elephants, pigs, rabbits, and even a fish. Endearing to adults and children alike, these whimsical creatures make perfect gifts and inspiring companions. One reader says,"These were made in a very short time once I got the hang of it. I am so into this book that I have run out of people to give them to! Now I am going to start making them for our local Children's Hospital. 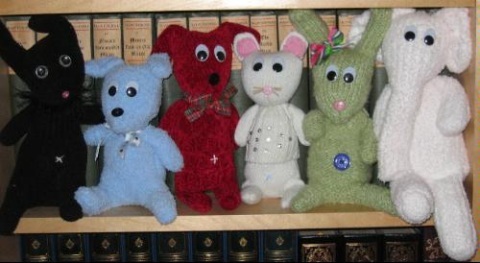 I made up the mouse in the middle." I'm thinking these might be a great craft to sell on eBay. You'll see many of them listed there for sale under the Buy It Now option (no bidding) from $5.00 to $20.00. They might also make a great craft to sell at craft fairs around Christmas time. Click here for more information.